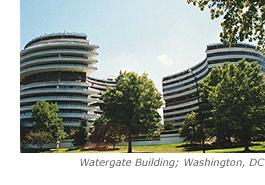 Facility Engineering Associates (FEA) was retained to perform a due diligence survey of Watergate 600 and the surrounding site in advance of a purchase agreement. A 10-year capital expenditure forecast was prepared which included major issues such as repair of portions of the post-tension cable reinforcement systems and relocation of the building cooling towers from the garage level to the roof. Subsequent to the purchase of the building, FEA was retained to provide design of the post-tension repairs, waterproofing system repairs, and relocation of the cooling towers. Design of the cooling towers included a structural evaluation of the post-tensioned roof slab and supporting columns, noise reduction systems, and preparation of architectural renderings of the cooling tower plan and elevations for approval by the U. S. Commission of Fine Arts. FEA performed construction administration and monitoring for the three major construction activities of this project: concrete repairs of post-tensioned slabs at the G level and garage B-2 level; waterproofing repair/replacement at the G-level slab; and installation of a new cooling tower on the main roof of the building. FEA worked closely with the contractor to determine areas of cable investigation and provide guidance for the repair and/or replacement of the cables and anchorages. The project also involved the installation of an acoustical monitoring system within the repaired slabs to provide the owner with an on-line real-time method of monitoring the condition of the post-tension cables in the future.